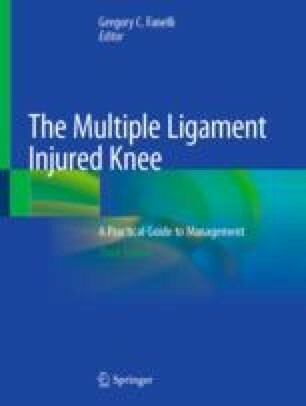 Ultra-low-velocity (ULV) knee dislocations are rare but increasingly common events. They occur most frequently in obese, morbidly obese, and super obese patients during everyday activities, but they can be as severe or more severe than high-velocity knee dislocations. ULV knee dislocations frequently are associated with neurovascular injury and other complications. Diagnosis, early reduction, and identification and treatment of vascular injuries are critical to reducing the risk of limb ischemia and possibly amputation. Given the size of the limb, maintenance of reduction in these patients almost always requires external fixation. While surgery on morbidly obese patients may be technically challenging, surgical reconstruction leads to improved subjective and objective results and is recommended. Centers for Disease Control and Prevention. Defining adult overweight and obesity. Available at https://www.cdc.gov/obesity/adult/defining.html. Accessed 24 April 2018. American Academy of Orthopaedic Surgeons. Position statement. The impact of obesity on bone and joint health. Available at https://www.aaos.org/uploadedFiles/PreProduction/About/Opinion_Statements/position/1184%20The%20Impact%20of%20Obesity%20on%20Bone%20and%20Joint%20Health(1).pdf. Accessed 24 April 2018.